Place Cascadian Farms™ Spud Puppies on top of the hot waffle iron. Press the waffle iron closed, using a bit of pressure as needed to slowly lower the lid over the Spud Puppies. 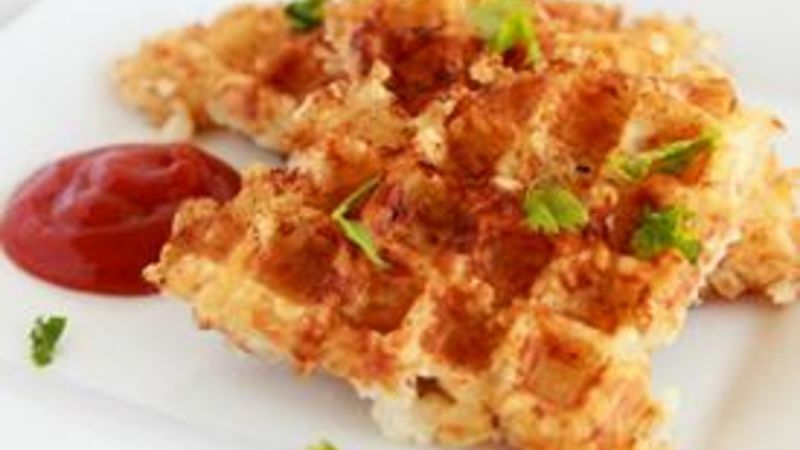 After 1 minute, open the waffle iron and add any spud puppies to empty spots, as needed. Close the lid and cook until crispy and golden brown. Remove from waffle iron. Salt lightly. Serve with ketchup, if desired. That waffle iron is a useful thang. Let it earn its keep when you use it for more than just waffles -- like for making HASHBROWNS! Guys. OMC. I mean Ohhhh. Emmmmm. Ceeeeee. It's like OMG, but the C is for sweet-and-holy Clever. Which, as it turns out, is exactly what you are when you make delicious, golden Waffle-Iron Hashbrowns. Clever! Come on and "C" how it's done! Got Spud Puppies and salt? Then you've got everythang you need to whip up hashbrowns in your waffle iron! Press the waffle lid over the top of your Spud Puppies. After about a minute, open the waffle iron to see how the hashbrowns are cooking. If you need to fill in any of the spaces, go ahead and add a few more Spud Puppies to the bare spots. You'll know your waffles are done when they are golden brown and crispy. Gorgeously delish! Gently plop your waffle onto a large plate. Allow to cool slightly before slicing into individual hashbrowns and serving to someone you love. O.M.C, rigggght? Oh. Emm. Ceeeee. It seriously does NOT get more simple than this. Easy creasy fleasy peasy. All of that is to say, holy waffles, Batman, this recipe is easy. So get hashbrownin' with your waffle iron!